If you live in the Americas, the indigenous continents for hummingbirds, attracting them to your garden as their seasonal home is a no-brainer decision. They make for outstanding pest control due to their hyper-active metabolism: as only birds that have the ability to hover by rapidly moving their wings in a figure 8 motion, they have tremendous need for caloric intake, and that intake is to your benefit as they terminate flies, spiders, mosquitoes, and a whole host of other insectoid pests. Of course, hummingbirds maintain their energy levels by slurping nectar (sugared water), but protein still remains their main source of vitamins and minerals. It is estimated that hummingbirds need to eat up to 10 meals per hour during the day in order to satiate their needs! Not all birds are pretty, but hummingbirds definitely don’t fall into that category. They regularly sport iridescent coloring as a result of refractive properties merging with the pigmentation of their feathers. On a sunny day, depending on the angle of the sun, you can see their sparkling little bodies zipping about, creating a paradise-like visage of your garden. Just observing them doing their daily business could become your relaxation hobby. In addition to being beautiful and useful as pest control, hummingbirds are also excellent pollinators as they move from one flower to another in search of nectars. Of course, in order for hummingbirds to make your garden a more permanent home before migrating, it would be beneficial to have a few nectar feeders hanging around. They are very cheap, and their bright colors that mimic flowers will surely attract them. Just keep in mind to clean them and fill them up with sugared water every couple of days, especially when temperatures are high. With that being said, nectar feeders are not the only method to attract these lovely little birds. There are certain potted flowers that are especially effective for this purpose, and can even replace the function of artificial nectar feeders entirely. If you aim to attract hummingbirds, you need to first understand how and which flowers would be useful to them, and more importantly – how would they perceive them. Animals and plants have been created to work together, so hummingbird’s instincts are strongly linked to certain shapes and colors of flowers. Knowing what these small birds like will help you make the best choices. Flowers that are tubular will often have significantly more nectar than non-tubular flowers. Such flowers also allow for easy access for hummingbird’s elongated beaks and tongues. Brightly colored flowers stand out in the environment, and that is exactly how hummingbirds hone in on them. Although red is a prevalent color people associate with attracting hummingbirds, and is the dominant color for commercially produced nectar feeders, the flower colors can have a wide range: blue, orange, yellow, pink, white, purple, and any hue in between. Flower count. By this we mean how many blooms does a flower produce. 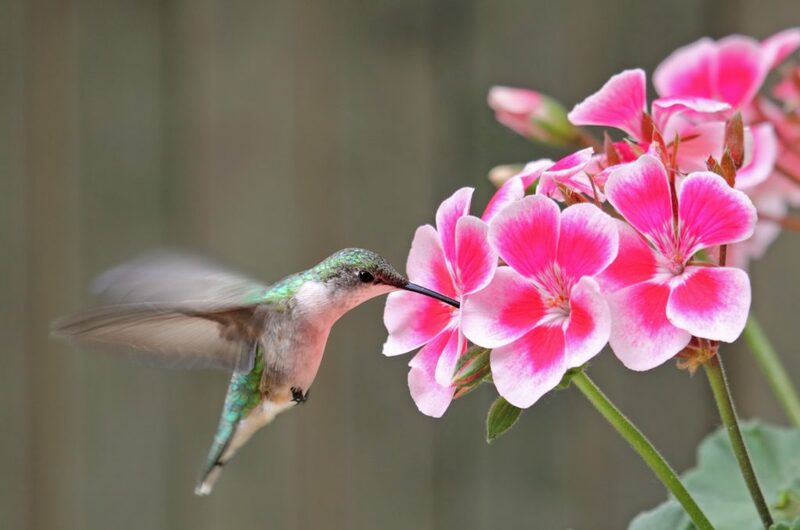 This is a big factor, as hummingbirds are likely to be attracted to more numerous clusters of blooms, than those with larger, but less numerous blooms. And finally, for how long do flowers bloom during the season. The longer they do, the more nectar will they be able to provide to hummingbirds. Of course, the only way to be certain that your flowers will bloom through entire season is to engage in staggered blooming This simply means that you space out your planting to ensure staggered flowering. This is also one of the reasons why potted plants (which could also mean hanging baskets) are so convenient to maintain and attract hummingbirds. Look up an image of each flower to figure out which one suits you the most; this will also give you a working pattern for which flower to choose if you find one on the market that is not on the list. Keep in mind also that many of these flowers will attract butterflies also, an added benefit when setting up. It reduces the danger of hummingbirds landing near the ground, which would provide for a tasty morsel for household cats. Do remember that cats kill millions of birds every year. Baskets are easier to adjust to lighting conditions, select a thematic flower color as they cluster, and are easier to maintain. Plastic baskets are better at retaining moisture. Always choose a larger one if possible. More space to work with, the better. If you can, hang them on an extender chain, which would allow for more convenient maintenance and adjustment for lighting conditions. Choose a coherent color theme of the flowers in one basket; look up professionally made hanging baskets online to get inspiration for your own creations. You should rotate the basket every week so that all the flowers receive a balanced exposure to sunlight. Keep yourself informed on the weather; if you know a heavy rain is coming, shelter the plants appropriately. Although some rain will not cause too much trouble, due to the shape of some flowers, they may fill up with water to the point of added weight breaking the stems. The soil should be kept lightly moist, and for the foundation you should get a moisture-retentive starter soil. Fill this soil for up to two-three inches below the rim of the basket. Only after you have placed your plants in this starter soil should you add the potting soil to fill the basket to the brim. In conclusion, it would be prudent to not rely solely on just the colorful flower baskets you hang, but also on hanging a few hummingbird feeders and birdbaths as well. Your newly moved-in hummingbirds will appreciate it.